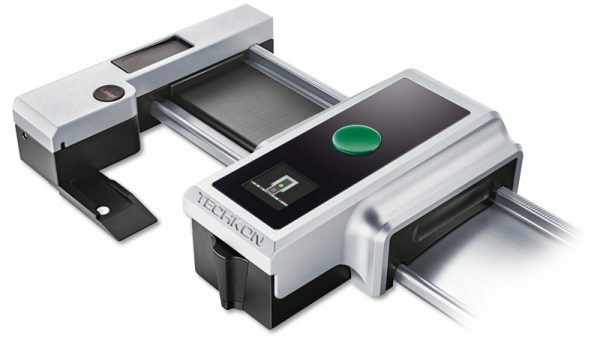 The SpectroDrive scans press sheet color bars in a matter of seconds while simultaneously sending spectral and density measurement data to a PC running the Techkon Expresso software. Scan a 40″ press sheet in less than 8 seconds. The measured density and color information is displayed with suggested density changes for more accurate color. The spectral color engine delivers unbeatable measurement accuracy and consistency over time. The SpectroDrive can be used for automatic scanning or as a hand-held device for “spot check” measurements. M0/M1/M2/M3 for compliance with G7 and new ISO standards. Displays color values, density, battery/wireless status, and shows current measurement conditions. Verify alignment of color bar more easily before scanning. Solid aluminum casing, wireless charger, improved wheel design. Use G7 functionality with recommended ink key specific adjustments of C,M,Y densities to obtain neutral values according to the G7 specification.